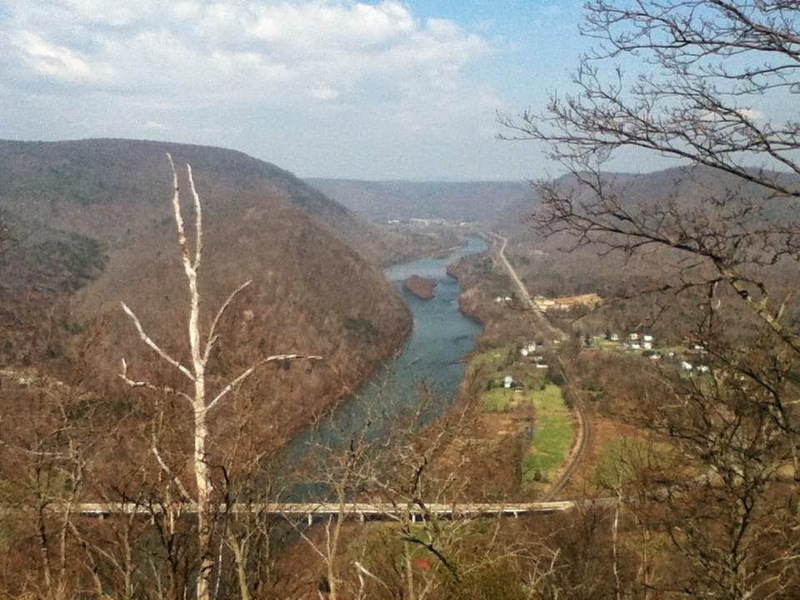 The Hyner View Challenge - and Wow! What a view! 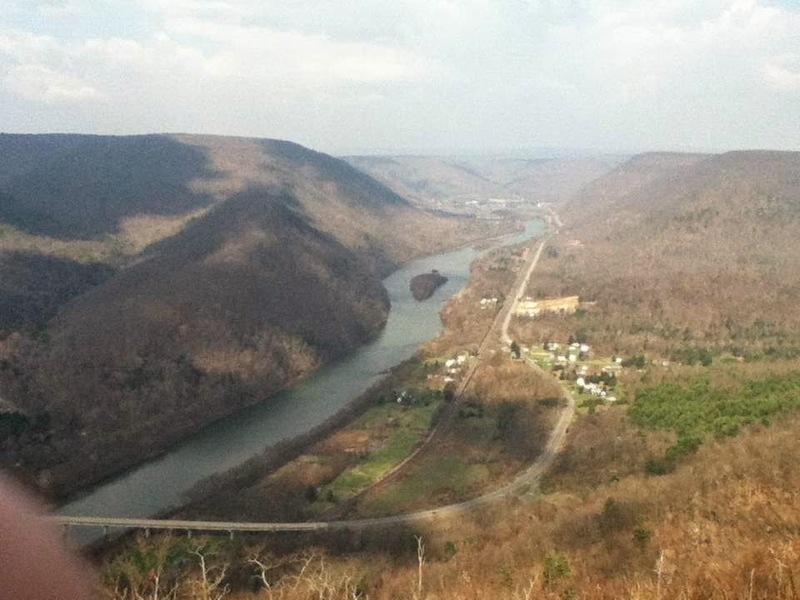 This past Saturday, April 26, 2014, was the 8th running of the Hyner View Challenge near Renovo, Pennsylvania. 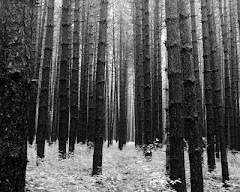 This is in the midst of the Pennsylvania Wilds, game lands and forests and parks. 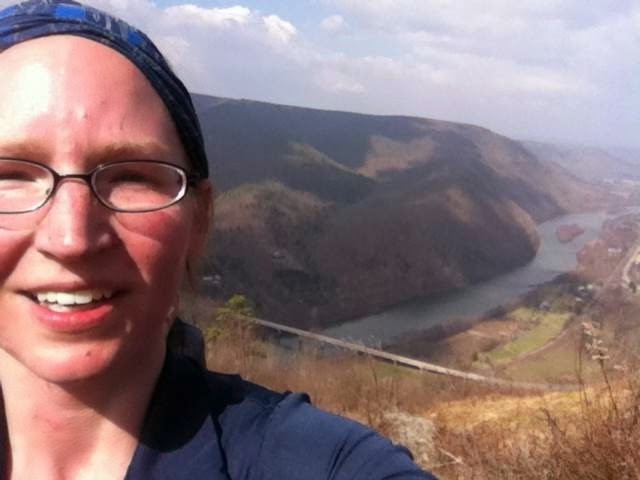 I knew I wanted to try the Hyner View Challenge ever since I had ran the Mega-Transect last fall. I knew the party would be awesome, and the trail would be gnarly and challenging, but I held off on registering. Then peer pressure kicked in. My friends Alisha and Kim said they were doing the 25k, and we should all go in and do it together and camp and enjoy the party, so I said, "Ok! I'm in!" I found out a bunch of my other friends from Oil Creek were doing the race too, as well as 1000 or so other trail runners, who all treat each other like family, so what was to lose! And it was winter - the time of signing up for races and then later realizing that you were insane to do so, but heck, it's training! So the month rolling out after my JC stone 50k was pretty abysmal running wise. 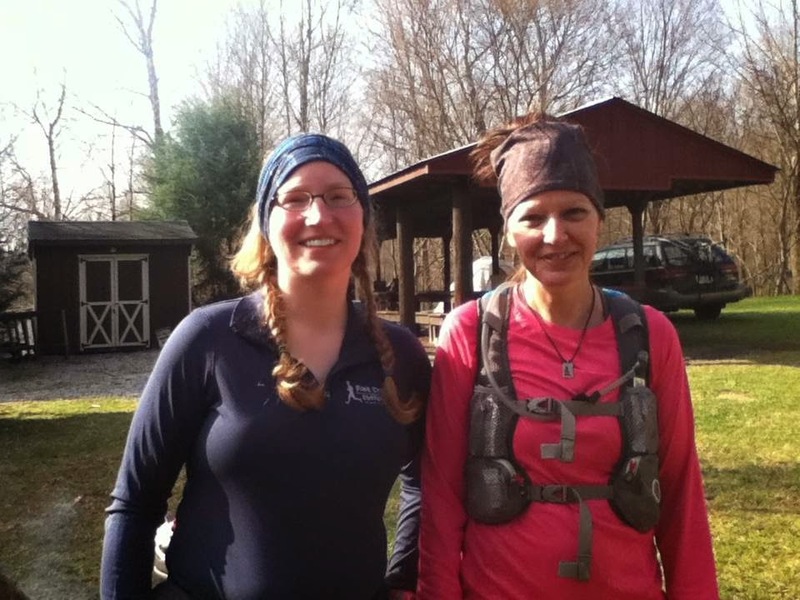 I was sick the week after, then started back to running with Kim, then went on vacation over Easter. I did do quite a bit of hiking in there, so though I hadn't been running, I felt rested and strong, so I wasn't too worried or nervous about Hyner. I knew the hills would be difficult, but I knew if I moved steady, I'd most likely be ok for that distance after running that pretty hard (for me) 50k in March. I drove to Alisha's house on Friday afternoon and met her and Kim and Daren. We were going to try to cram everything in the Forester, but when I got there, we knew two cars would be a better idea. So I drove with Alisha, and Kim and Daren followed in the Beemer. Our friend Chris was meeting us later that night. It was raining but good as we left Mercer, but as we traveled east, the rain eased up, and it wasn't even sprinkling when we stopped to get subs to eat once we got to the campsite. The windy roads through Sproul state forest were really beautiful, and it was a fun drive to the Western Clinton Sportmen's Association campground. We arrived around 5, and found a campsite (probably not in the best place on top of the hill, when the wind picked up), but we set up the tents, staked them as best we could in the rocky ground, then ate our subs. 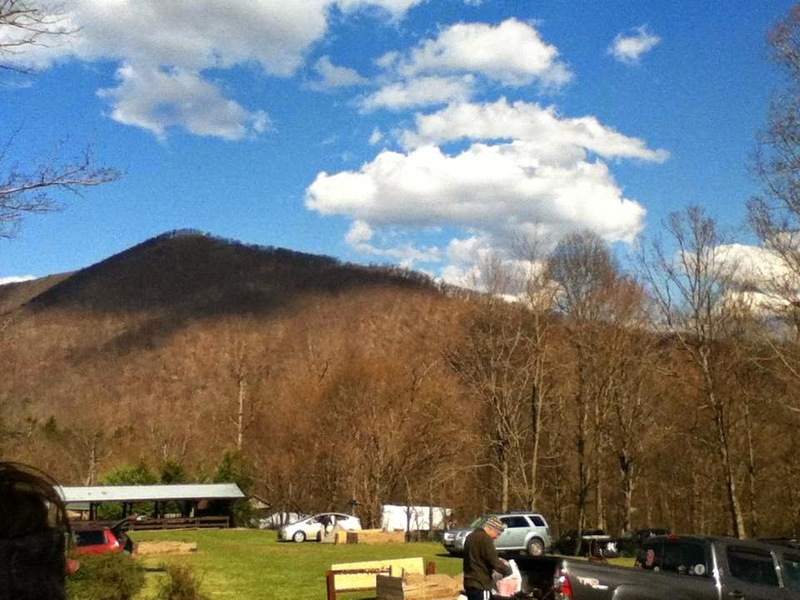 The campground, with Humble Hill towering over us. We stopped at the main building at the camping area, and saw there were soooo many desserts dropped off for the post-race festivities the next day. I wish I had taken a picture of them. There were at least 100 different desserts on the tables - cupcakes, cakes, cookies, looking sooo yummy. I was glad I had at least brought some cookies for our little group. 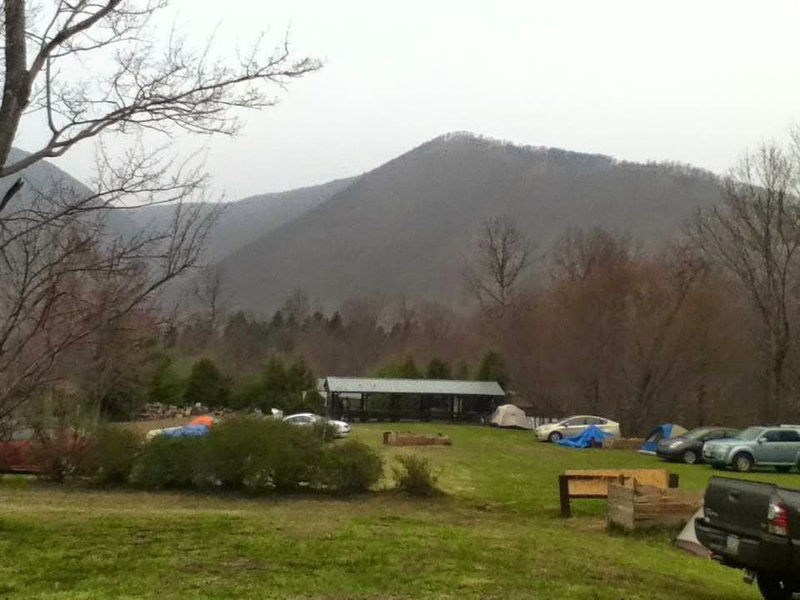 It was chilly and drizzling as it started to get dark, and we saw that some other folks were gathered around a fire, so we joined them, talked running for a bit with good folk, then made for our tents and sleep around 9:30. 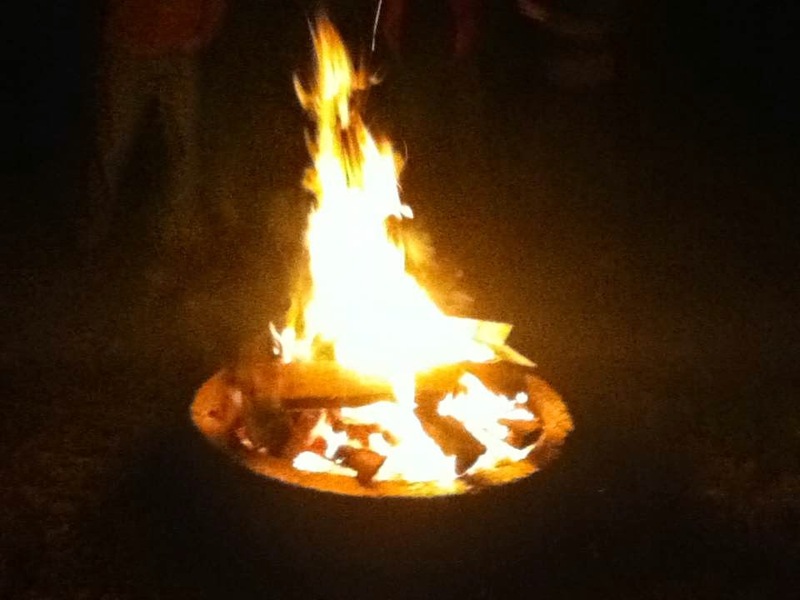 The fire was great at evaporating the chill brought on by the rain. I slept decently, woken up a couple of times by camp noises, some steady rain, and some wind roaring through at a couple of points. I woke up as birds started singing, saw it was not quite an appropriate time to wake up, but after a little while, got up anyway. We got up and got ready in the brisk morning. The rain had stopped and the skies were fairly clear, with a little bit of clouds. We made our way down to breakfast that was provided for the campers - I had toast and peanut butter, and we made camp coffee. 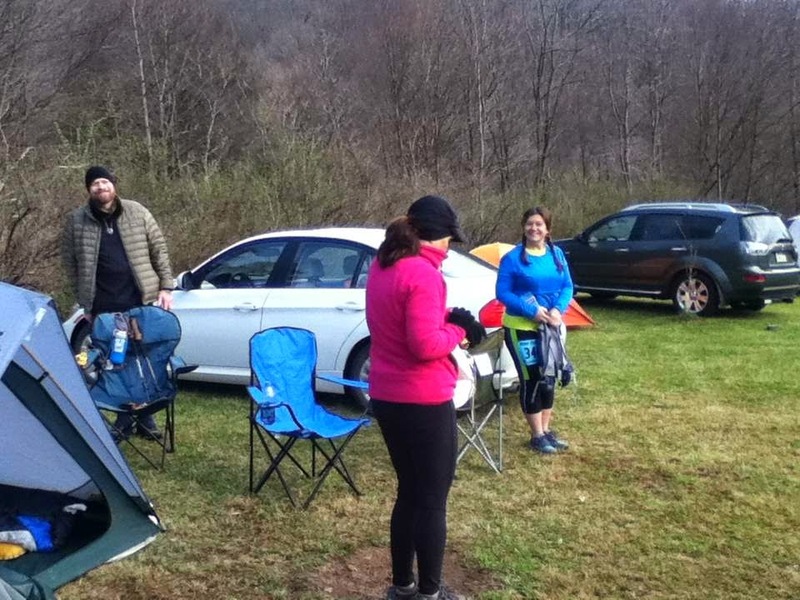 We heard the cheers across the street for those who started the 50k at 7, and we made sure we we visited the bathrooms plenty of times, and had everything ready for our start at 9. Quick picture with Alisha before we started. We stood in front of the fire for a little bit while the rest of the 800 runners arrived and started grouping up at the start. The morning was chilly, and the fire was really really great for taking off that last bit of chill. I put some bug-spray on my legs (after a tick scare a couple of weekends before, ick), was wearing my waist pack with gels and had sports drink in one bottle, and water in the other. I was as ready as I was going to get. 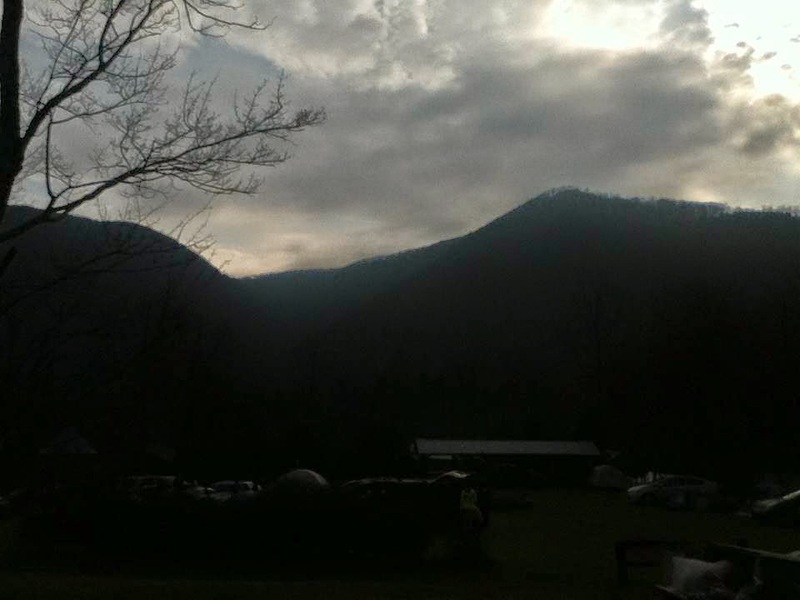 I did forget to put sunblock on, but it ended up not being terrible, as it was a mix of clouds and sun during the day. We all scrambled into the starting area, wished each other good luck, hugs and high-fives, and Alisha and I moved into what looked roughly like mid-pack. Daren wasn't too far behind us, and Chris and Kim were nearby too. They counted down, and we were off! As in most races this size, the beginning was a crowd, but the energy was great. I did my best to stay with Alisha as we worked our way down the dirt driveway towards the paved road where we would stay for about a mile before getting to single track. I picked my way carefully through some people, and I heard someone fall behind me, but I didn't stop, aware of the crush. I get a little nervous in so many people, so I just kept moving and once we broke out onto the 2 lane wide paved road, the crowd opened up a bit, and Alisha and I ran with the masses across the bridge, cheering, and focusing on moving quickly, so we could attempt to avoid a bit of bottle-necking. But we didn't really. There was a line when we got to the end of the paved road, and people were making their way onto the trail. Everyone was cheerful though, and people made their way, and the trail started up, with a little bit of climb, but mostly even along the side of the hill, following the river. 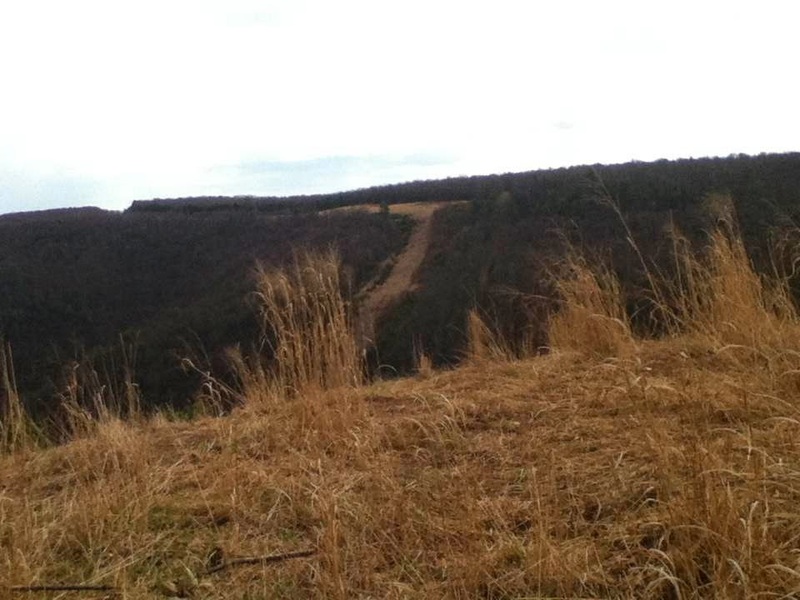 The view from the first mile of trail, before Humble Hill. Then we started to go up. Steeply. Humble Hill was the first of three extremely challenging hills on the course. It was a rough climb, but the number of people on the course seemed to help. There were a lot of pauses in the going up with the amount of people working their way up the hill. Most people who needed a rest would move off to the side a bit and let the rest of the line pass them. A few other people were passing off of the trail, but then cut back in further up, which I don't think sped anyone up much, but slowed anyone behind down as they had to cut back into the line to get back on the trail. Alisha and I climbed without pausing as long as the line was moving. I was feeling pretty good about how I was holding up, and the beginning of Humble Hill flattened out and let us run for a little bit, until it went up again. Breathing hard part of the way up Humble Hill. 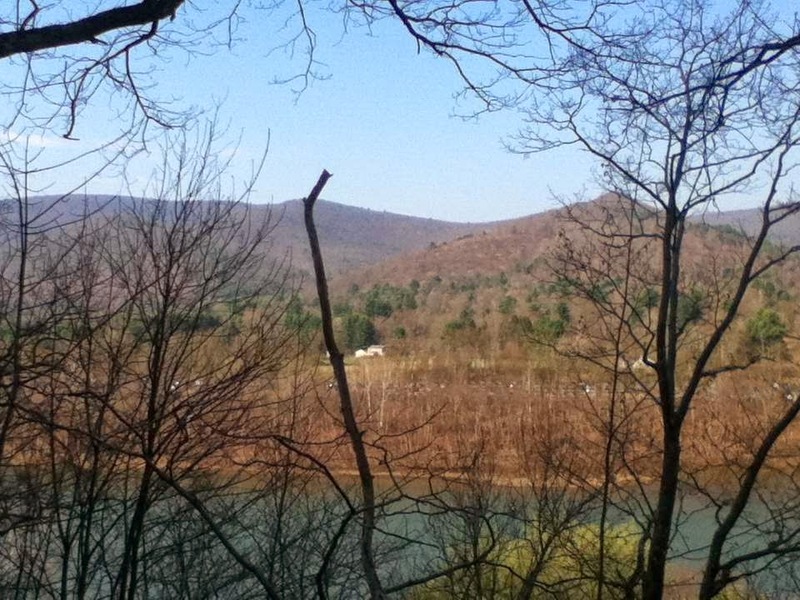 The view from one of the flatter portions of Humble Hill. Grabbing a quick photo before the Hyner View at the top. One last quick snap before the first Aid Station. I wish I had taken a few more pictures, but the adrenaline of the people behind me was pushing me. People were cheering us on from the top, and as we came around the overlook tower, the Aid Station was there! Alisha and I each grabbed a cup of gatorade, then headed for the downhill. I had eaten one gel and been drinking as we went, and felt great, until we started to descend. A few switchbacks down, and a stitch in my right side started. I do get these occasionally, and if they're bad, I'll stop or walk until it goes away, but I didn't want to walk, so I gritted my teeth, tried to switch my breathing pattern to see if that would help, and thundered down the hill behind Alisha. I complained to myself about it in my head, but didn't let up on the downhill pelt. I was watching my footing, running well, and we were nearly at the bottom, when I stepped on a root to go over, and slipped, and down I went. I hit hard on my hip and calf, bounced up, said I was ok to the concerned people around me, and kept going. On the bright side, my stitch disappeared. But I would have a serious bruise. I was a little jarred and sore, but everything felt ok, so we kept up the pace. We came to a stream, and I'm not sure how many times we crossed it, but going was slow there. The 50k trail joined back with the 25k at this point, and I saw friends from Oil Creek, Dan Young and David Renninger pass by, and cheered for them. 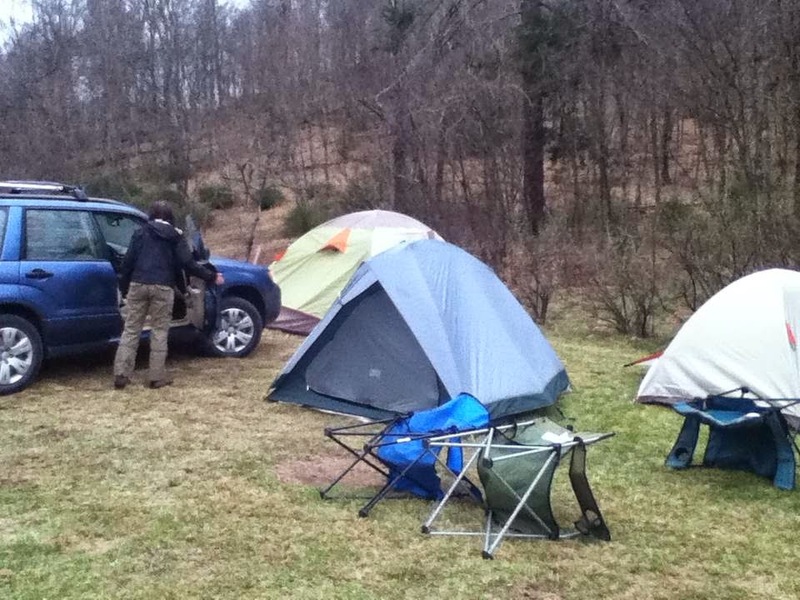 As we started up the second hill, our friend Daren, who had camped with us, caught us. This was his first trail race in a while, and being an awesome hiker, he fit right in, and his height must've been an advantage. We bantered while we climbed the hills, and it was good to be away from all of the creek crossings. I have to say this hill was not quite as bad, and we were at the second Aid Station. I unscrewed my bottle top coming into the station, and grabbed a gatorade and topped off my bottle. I had been drinking and eating steadily, and felt great. I didn't feel like grabbing any real food. I waited for Alisha and Daren, and off we went. We came descended into a very rocky downhill, that I took off down like a goat on fire. I don't know where the energy came from, but I bounded down there, passing a bunch of people, and bouncing off of rocks like I was made of marshmallows. Alisha and Daren weren't too far behind me, but I took advantage of the feeling good just to flex my trail running muscles. I ran a lot on road and track and non-technical trails during the winter, and speeding down with confidence made me happy. I must've looked like a nut, thirty-plus years old, bounding down the really rocky trail with arms fluttering occasionally... but I felt amazing. I hit the bottom of that descent, and we started up again, and as I ducked under a fallen tree, I looked back to find out how far back Alisha was. I saw her pink shirt just a few people behind, and I also saw another Oil Creek friend, Adam. I gave him a hug, and wished him good luck as his long legs carried him up the hill to finish the 50k. 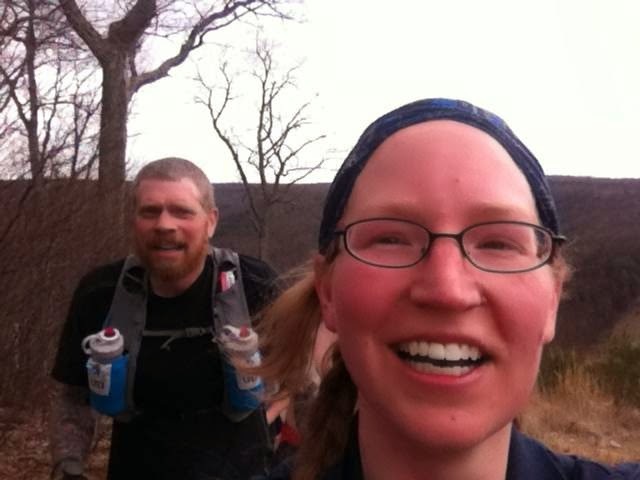 Daren and Alisha caught up, and we climbed the last hill, the S.O.B. Daren and I at the very top of S.O.B. Lopsided picture from the top. As you get closer to the top of this final climb, it becomes more about balance and using your hands to climb at times, because of how steep it is. I really didn't look behind me as I was climbing, not wanting to teeter over and take anyone else with me. I have to say it was nice to have Alisha leading up this hill, so I could step where she stepped, and also to have Daren behind me, because he could probably slow me down slightly if I fell. 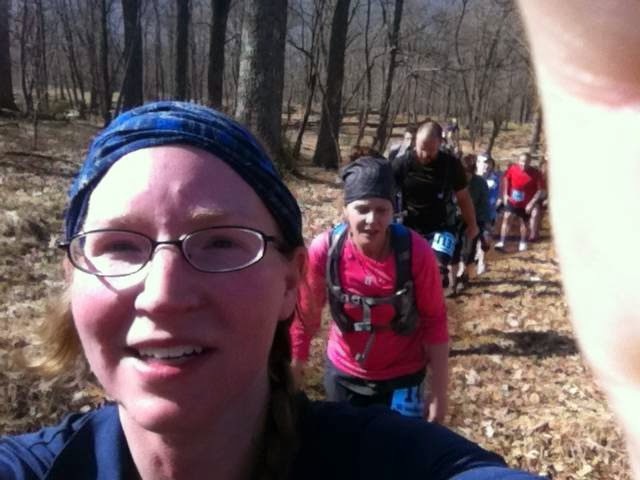 But I didn't fall, and we made it to the last Aid Station. My stomach had been growling at me for a bit, even though I was stuffing in gels, so I ate a banana, and soon after that another gel, hoping that would get me through to the end. There was a bit of slight uphill double track, then we were back to some very pretty winding trails on the top of the ridge. Then we started the endless down. The only plus to this was that I knew it meant we were getting to the road. The rocky and steepness of this slope meant no throwing myself down it with glee, so we settled in with another group of ladies to do a bit of a trot down the slope. My legs were pretty toasted by this point, but we kept going. We crossed a small bridge, then an angry little uphill surprised us right before dropping back down onto the road. Oh... man, that road section. The flat felt like I was running through syrup for that last mile. How can the rest of a race fly by so fast, and that last road mile feel soooo bad. I stayed a few paces behind Alisha, telling myself just to push a little harder and to keep up with her, so I did. We came to the last tiny bit of trail that led to the finish, and walked the slight uphill part, until I heard little voices cheering us on. A few little girls were cheering, telling us that we were almost there, not to give up, and if that didn't put that last little bit of spark in my step, thinking and hoping how these little girls would be trail runners one day... well nothing could. I high fived the little girls, and did a reasonable bluff of a sprint charge with Alisha across the finish line. And there was Hyner, spitting me out after chewing me up. Beautiful perfect skies after finishing. And so, another trail run in the books. Alisha and I ended up finishing middle of the pack in 4 hours, 53 minutes. Daren was only 5 minutes behind him. We had lost him on that last downhill. Chris finished around 5:30, and we cheered Kim in around 6:15. The food and party afterwards were amazing. I chatted with friends, ate much chicken and also amazing cake, but I tend not to be too hungry right after a race, and made sure I didn't upset my stomach too much. 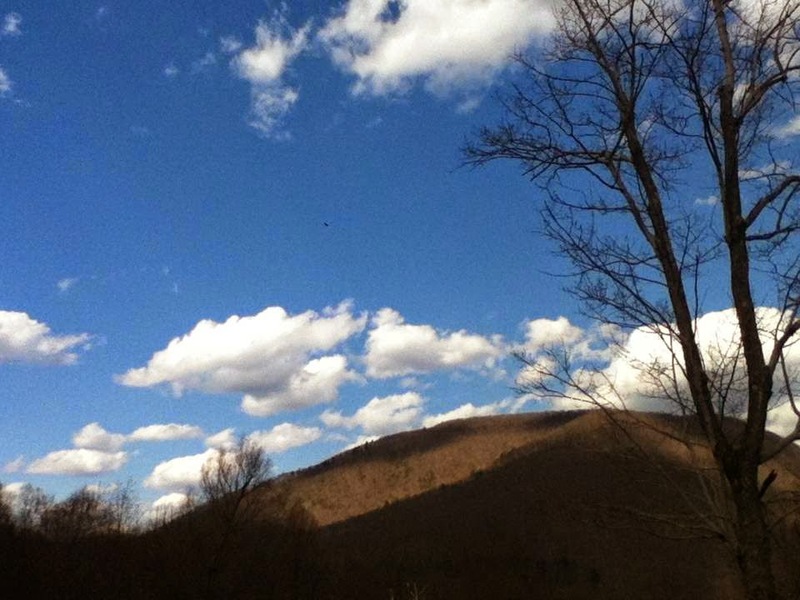 Goodbye, Hyner View... until next time.